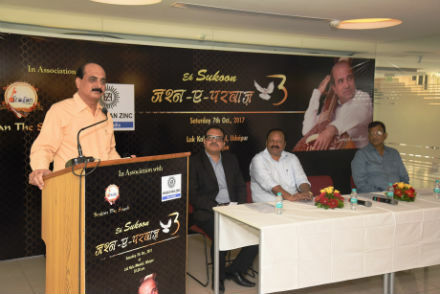 Udaipur: Hindustan Zinc and Srajan the Spark will present ‘Ek Sukoon – Jashn ae Parvaaz’ on 7th October 2017 at Lok Kala Mandal, Udaipur, where renowned music composer Anand Ji will be honoured along with 7 upcoming artists in the fields of music, arts and literature. Renowned singer – Suresh Wadkar will be performing in the event, along with the artists Javed Hussain and Aryan Mathur. A press conference for the same was organized at the head office of Hindustan Zinc – Yashad Bhawan where on the dais were Sunil Duggal-CEO – Hindustan Zinc, Pavan Kaushik-Head Corporate Communication – Hindustan Zinc, Lokesh Chaudhary-President – Srajan The Spark and Rajesh Khamesra-Coordinator – Srajan the Spark. In the conference, CEO of Hindustan Zinc, Sunil Duggal said, “Jashn-ae-Parvaaz is a wonderful initiative which we have been taking up since the last three years. Hindustan Zinc has always encouraged music and culture in this city, be it World Music Festival, Smritiyan or Srajan the Spark. I propose that all music promoting organizations of Udaipur should join hands and annually organize a one-week musical extravaganza”. Head – Corporate Communication, Hindustan Zinc, Pavan Kaushik said, “We often remember the songs but forget who created them – We forget the name but remember the works. Events like these evoke in us the splendid melodies of the past.” On being asked about Hindustan Zinc’s contribution in the Smart Cities project, Pavan Kaushik said, “Hindustan Zinc in association with the Government of Rajasthan built Rajasthan’s first Sewage Treatment Plant (STP) under Public Private Partnership Model to address the problem of growing pollution in the lakes of Udaipur. Initially treating 20 MLD (million litres of water per day), HZL is now expanding the capacity to 60 MLD. Rajesh Khamesra, Coordinator-Srajan said that Hindustan Zinc in association with Srajan honours a personality each year in ‘Jashn ae Parvaaz’ and awards a prize money of Rs. 1 Lakh. This year, being awarded is Anand Ji of Anand Ji Kalyan Ji fame. In the first year of ‘Jashn ae Parvaaz’, the award was presented to the renowned singer Roop Kumar Rathod. The next year, the awardee was the renowned actor Shailesh Lodha of the TV series Taarak Mehta ka Oolta Chashma. ‘Jashn ae Parvaaz’, will be held at Lok Kala Mandal in Udaipur on 7th October 2017. The event will be presided over by CEO – HZL, Sunil Duggal and the Chief Guest will be State Home Minister – Gulab Chand Kataria.